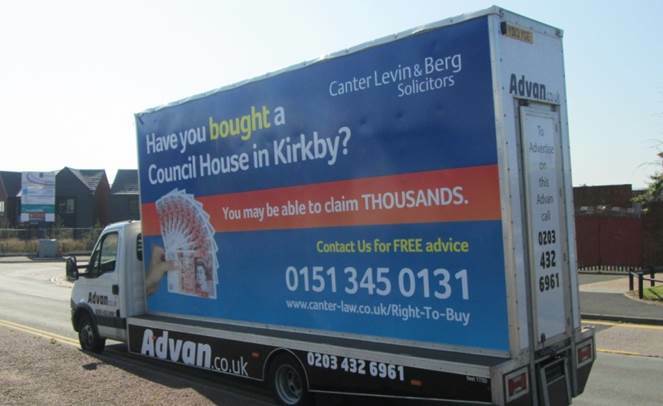 Canter Levin & Berg solicitors have used a traditional Advan to raise awareness of the thousands of pounds that may be on offer to residents in Kirkby. Explaining that this may entitle people to be “able to claim thousands”, the campaign combines a striking message with the high impact format of an Advan to ensure a real head-turner. With a contact number clearly displayed, residents, pedestrians and road users all have the opportunity to absorb the message and contact Canter Levin & Berg for more information. Advans have dual-use, in being able to act as both a static and mobile advertising format. Perfect for a short term and topical campaign such as this, Advans project a campaign throughout a desired area, offering fantastic reach and impressive results.